Let's face it. If you live in New York City, where light pollution is perhaps as bad as it gets, there aren't too many celestial sights that you can look forward to seeing. 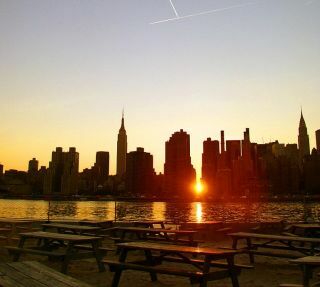 And yet, twice each year, New York residents and visitors from around the world are mesmerized by an uncommon appearance that occurs near sunset in the giant metropolis. But Manhattanhenge's origins are not nearly as mysterious. The phenomenon is based on a design for Manhattan outlined in "The Commissioners' Plan of 1811" for a rectilinear grid, or "gridiron" of straight streets and avenues that intersect one another at right angles. This design runs from north of Houston Street in Lower Manhattan to just south of 155th Street in Upper Manhattan. Most cross streets in between were arranged in a regular right-angled grid that was tilted 29 degrees east of true north to roughly replicate the angle of the island of Manhattan. And because of this 29-degree tilt in the grid, the magic moment of the setting sun aligning with Manhattan's cross streets does not coincide with the June solstice but rather with specific dates in late May and early July. While we say that the sun sets in the west, most times that's not exactly the case. Like the popular axiom "A broken clock is correct twice a day," the sun sets at precisely due west only twice each year — on the equinox days in March and September. But between the first day of spring and the first day of autumn, the position on the horizon where the sun appears to set, known as the azimuth, actually occurs somewhat north of due west. The azimuth of the sunset slowly shifts northward until the day of the June solstice; thereafter, it reverses course and shifts back to the south. On June 21, the sun sets at an azimuth of 302 degrees, or 32 degrees north of due west. But for the setting sun to be seen from all of Manhattan's cross streets, its azimuth must be 299 degrees, or 29 degrees north of due west. That happens twice — first as the sun is climbing toward the solstice in late May, and then for a second time after the solstice, as the sun migrates back toward the south in early July. And that first opportunity in late May is rapidly approaching. The man who first brought attention to the Manhattanhenge phenomenon almost 20 years ago is the noted astrophysicist and director of New York's Hayden Planetarium, Neil deGrasse Tyson. He has written an interesting blog post on the topic, which you can read here. For those who will be in New York City and hope to get a view of this year's spectacle — and maybe even snap a photograph — here is a tip: While any cross street will suffice, Tyson suggests specific wider, two-way cross streets that ensure the best views of the west-northwest horizon (toward New Jersey): 14th, 23rd, 34th, 42nd and 57th streets. "The Empire State Building and the Chrysler Building render 34th Street and 42nd Street especially striking vistas," he noted. We should also note that the times provided below are not for the exact moment of sunset. Sunset is defined as when the very top of the sun disappears below a "true" astronomical horizon, such as what one might see from a ship out at sea. For the Manhattanhenge effect, allowances must be taken for hills and any landmarks along the distant New Jersey landscape, so the sun's altitude is assumed to be 1 degree (or slightly less) above the actual horizon. In 2018, there are four possible dates to see the effect. For your first opportunity in May, the dates to circle on your calendar are May 29 and May 30. On the first date, at 8:13 p.m. EDT, you will see a "half sun" — that is, half above and half below the landscape. On the following night, at 8:12 p.m. EDT, you will see a "full sun," with the entire solar disk resting above the horizon. Some of you might be wondering if Manhattanhenge is visible at sunrise. The answer is yes, but you'll have to wait until late in the year to see it. Once again, there are four opportunities — this time, flanking the date of the winter solstice on Dec. 21. At this point, we will be looking 180 degrees in the opposite direction, toward an azimuth of 119 degrees or 29 degrees south of due east. The first chance comes on Nov. 26 as the sun continues to shift to the south, with a "full sun" at 7:06 a.m. EST, followed by a "half sun" on the 27th at 7:05 a.m. EST. After the solstice, the sun reverses course and begins to shift back to the north. On Jan. 15, we'll see a "half sun" at 7:27 a.m. EST, followed the next morning by a "full sun" at 7:28 a.m. EST. Keep in mind, however, that unlike with sunset, there are more likely to be local obstructions to your visibility of the rising sun. Those living in Upper Manhattan and Harlem must contend with buildings and structures rising up from The Bronx; those on the Upper East Side and Midtown will be looking toward Queens; and those in the East Village down to Houston Street will be facing Brooklyn edifices. Of course, in attempting to see or photograph Manhattanhenge in the morning, one must also consider that the ambient late fall/early winter morning air temperature is likely to be anywhere from 30 to 60 degrees Fahrenheit (17 to 33 degrees Celsius) colder than the temps in late spring/early summer evenings — and there could even be some snow (especially in January). And lastly, the odds of clear and sunny winter-morning weather are considerably less favorable compared with having a clear and sunny summer evening. But whenever you attempt to see Manhattanhenge, be it summer or winter, evening or morning, we wish you good luck and clear skies! Of course, there are other places on Earth where the sun aligns with certain landmarks at specific times of the year. Probably the most famous is Stonehenge, the Neolithic monument at Wiltshire in the Salisbury Plain of England, where, on the day of the summer solstice, as seen from inside the monument, the sun appears to rise directly above the so-called Heel Stone. It's an event that attracts thousands of people each year. Although experts are fairly certain that the massive upright stones that constitute Stonehenge took about 1,500 years to construct and that it probably once served as a burial ground, many mysteries about it still abound. More than half a century ago, British astronomer Gerald S. Hawkins and co-author John B. White published a book, "Stonehenge Decoded" (Doubleday, 1965), which claimed that Stonehenge was used to predict a wide number of astronomical occurrences. While gaining a large following, the book also attracted the criticism of more than a few reputable scientific scholars, who scoffed at its findings. All these years later, the issue remains a contentious one, and the true nature of Stonehenge may forever be a mystery.